The next pyramid that was built stands less than a mile north of the Bent Pyramid. Its height is roughly the same as the latter but it was erected entirely at an angle of 43^°, the same as the upper part of the Bent Pyramid. This means, of course, that the area it covers, 220 m. square, and its mass somewhat exceed that of the Bent Pyramid. It is the earliest monument which has been preserved in a complete pyramidical form, but owing to the low angle of elevation it looks rather squat and less impressive than its better-known successors at Giza. Its rather gentle slope made it more accessible to stone robbers and almost all the limestone casing has disappeared, giving it a deeper colour than its southern neighbour, which has earned it the name of the ‘Red Pyramid’. It has been given less attention by archaeologists than any other pyramid, and any subsidiary buildings which may exist, and its causeway, lie still buried under the desert sand. Huni may have been the builder of the Meidum pyramid, or at least of its earlier stepped form. However, his name has not been found anywhere in it. On the other hand, later graffiti in the Meidum pyramid’s mortuary temple ascribe it clearly to Snofru. Moreover, a number of Snofru’s courtiers were buried at Meidum. An inscription found near the Red Pyramid mentions ‘the two pyramids of Snofru’ and it was at first assumed that the other Snofru pyramid must be that at Meidum. More recent work at the Bent Pyramid has, however, shown that this one, too, definitely belonged to Snofru. We are therefore left with what Sir Alan Gar-, diner called the ‘unpalatable conclusion that Snofru did possess three pyramids’. All the Fourth Dynasty pyramids are distinguished by a polar entrance passage, and if we want to invoke' Huni as the builder of the early phase at Meidum, we are faced with the additional difficulty that this feature was already embodied in the first stepped structure. Whichever way we look at the problem we cannot get away from the fact that for this penoa, there exist more large pyramids than pharaohs who could have been buried in them. The start of a new dynasty was, as can be seen from the genea logical table, evidently due to the fact that Snofru was not the son of Huni’s great queen. However, he clearly legitimised his claim to the throne by marrying the great queen’s daughter, Hetepheres. On her tomb furniture, which was discovered by Reisner, she is described as ‘daughter of the god’ and ‘mother of the king’. This king was Khufu, who is better known today by Herodotus’ Grecianised appellation of Cheops. Khufu’s right to the throne was clearly established by his marriage to his sister, Merytyetes, who was the vehicle of the royal blood and who carried the succession. He built the largest of all pyramids at Giza, 20 miles north of Memphis. The most striking feature of Khufu’s monument, when compared with its predecessor, the Red Pyramid of Dahshur, is a return to an elevation of 520. It also covers an even greater area of 230 m. square and comprises roughly 6£ million tons of limestone. Rising to a height of almost 150 m. it impresses by its towering simplicity, and has always been regarded as the foremost of the Seven Wonders of the World. We will not, at this stage, estimate the work required in building it nor deal with the method of construction,which will have to be discussed later. However, we must mention here two interesting peculiarities, one concerned with the geometrical shape of the monument and the other with the unique disposition of its internal features. A pyramid with an angle of elevation of 52° - 510 52' to be precise - has the unique geometrical property that its height stands in the same ratio to its circumference as the radius to the circumference of a circle. This ratio is 1/2IT, where TT is a transcendental number 3.141. . . Khufu’s pyramid is the most carefully built of all and accurate measurement of its foundation has shown that this ratio is correctly represented to better than one part in a thousand. This certainly is far too accurate to be dismissed as a coincidence, and a great number of theories, often involving divine inspiration, have been based on this astonishing numerical fact. 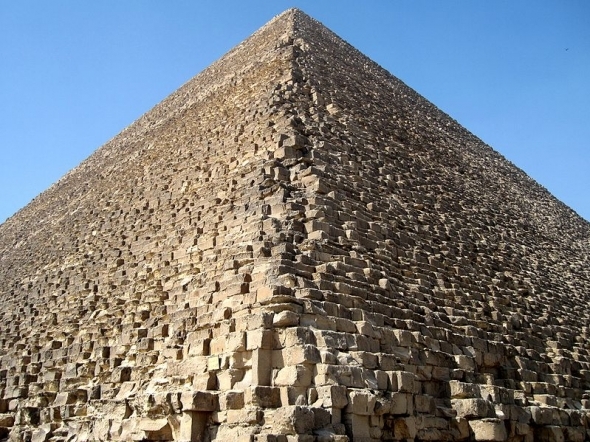 A relatively simple solution, to which we shall return in the next chapter, provides something of an anticlimax and relieves us of the necessity to regard the great pyramid as an immense monument in stone, representing the revelation of a basic mathematical truth. It appears that the arrangement of passages and tomb chambers of Khufu’s pyramid underwent three successive changes. The usual polar entrance passage in the north face of the building first runs through the masonry and then continues into the rock beneath the pyramid. Under the apex, the passage ends in a chamber hewn out of the rock, whose irregular shape and rough finish show that it was abandoned before completion. Instead, the original descending passage was interrupted about 20 m. from the entrance and a corridor ascending at the same angle was driven through the existing masonry of the pyramid. After about 40 m. the ascending corridor levels off into a horizontal passage, leading to a second tomb chamber, again under the apex, and about 30 m. above the base of the building. This room, without any justification called the ‘Queen’s chamber’, also gives the impression of being unfinished and was possibly never used. Then the ascending passage was continued beyond the levelling-off point, but in a much enlarged form. It now turns into an ascending gallery of polished limestone, 47 m. long and nearly 9 m. high. Its walls are slightly corbelled and each of the roofing slabs is held separately by notches in the walls. This impressive high passage, usually called the Grand Gallery, was for a long time believed to have served ritualistic purposes until it was discovered by Flinders Petrie that its real object was to serve as a store for a series of large limestone blocks. These blocks, when the tomb chamber was to be sealed, were let down into the ascending passage where, in fact, three of them are still in position.